The benefits of extracurricular activities are well-known. Kidshealth.org lists the physical, social, academic, and creative benefits. In addition, students learn time management as they balance their personal schedules. There is another less obvious benefit to signing your kids up for extracurricular activities: peace of mind. When your child is engaged in their activity of choice, you can rest easy knowing they are happy and doing something productive. Many schools offer the standard fare of after-school doings — sports, cheerleading, choir, band, chess club, language clubs, etc. These classics are always fun, and if your child wants to branch out, you can always check out new and interesting extracurricular activities. Culinary Club: Over the last few years, so many home economics classes have been cut from schools, they are all but extinct. 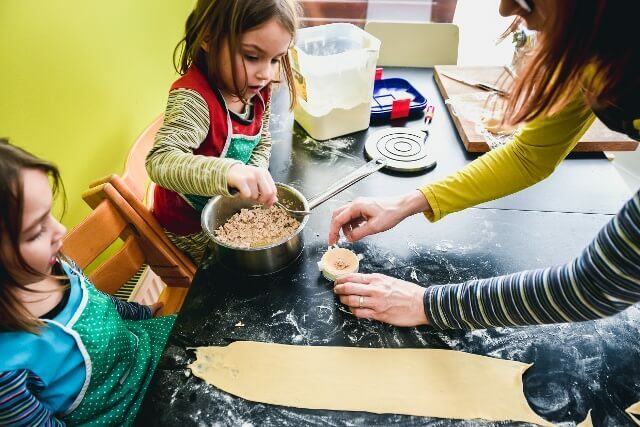 Kids’ cookbooks tend to focus on cookies, cakes, and numerous incarnations of pizza. But there is a world of simple, healthy recipes just waiting to be discovered. In a culinary club, students can learn about world culture, make new friends, and invent their own innovative fusion cuisine. Who knows? Before long, perhaps you will be the one texting your son or daughter, "What's for dinner?" Skills developed in these classes include measuring (mathematics), reading, following directions, cooking, kitchen safety, and cleanliness. Yoga and Mindfulness Techniques: Extracurricular activities can also teach kids how to handle stress or anxiety. Standardized testing, honors classes, competitive sports, and hours of homework can all lead to kids being overwhelmed. Yoga and mindfulness teach kids to improve their physical and mental well-being in a nonjudgmental and supportive environment. Put on your sweats, stretch, take some deep breaths, and relax. Skills developed include meditation, prioritizing, relaxing, flexibility, goal setting, stress management, and self-improvement. Emergency Preparedness: Knowing what to do in a disaster can save your life and perhaps those of your friends and family. In an emergency preparedness club, extracurricular activities include being trained and certified to perform CPR, learning to use a defibrillator, and making an evacuation kit. Skills developed include first aid, disaster response, life-saving techniques, survival skills, and large group management. Classic Films: In a film club, students can compare old and new movies and even hold their own Oscars. Skills developed include critical thinking, character and story analysis, and filming techniques. Dungeons & Dragons: D&D, as it is commonly called, is a social, interactive team role-playing game (RPG), in which players gather around a table to act out a fantasy adventure story. A game master, who acts as a referee, writes a story outline usually involving castles, royalty, dungeons, hidden treasure, and a host of monsters. While in character, players work together to solve problems and overcome obstacles as the story unfolds - no computers or electronics necessary! Skills developed include creative writing, teamwork, critical reading, mental arithmetic, and planning. Poetry Slams: A poetry slam is an informal, friendly competition where students gather to write and recite original work. This can include performance poetry, rap, improvised comedy, or even dramatic reading. Skills developed include self-expression, public speaking, creative writing, constructive feedback, and self-confidence. Extracurricular activities are a wonderful way to enrich your child’s life. Want to know where to begin? Ask the experts — your kids!